After this stop at the home of Jigmet, my cameraman, in Mulbekh (40km from Kargil), I’ll be heading off the Leh-Srinagar Highway towards the more remote Zanskar region where internet access is almost non-existent. Mobile phone connectivity is also poor, so if I can get any more blogs published in the next 4 days, it will be a huge bonus. Locals and GHE organisers suggested that today’s ride would be immensely tough and tried to steer me towards breaking the journey into two days to cope with the two passes, Foti La (4108m) and Nimuk La (3800m), but Jigmet had offered for me to stay at his place in Mulbekh, just after the second pass and I thought it a good idea. As it turned out, I found today easier than the previous two, to Photoksar and back. The road surface was beautifully smooth, the gradients I generally found to be reasonable and the altitudes weren’t nearly as high as Sirsir La. I’m probably getting fitter and better acclimatised too. The ride was all done by 2pm and had I not committed to staying in Mulbekh, would have easily rolled on to Kargil, Ladakh’s second largest town. Other than the obvious long climbs, there were a couple of challenges, one being the weather. A cool, overcast day, once over Foti La, turned into a rainy one, and by the time I’d descended to the valley, I was pretty cold. My new Proviz cycling rain jacket got a good test, to keep the rain and wind chill out. Another negative was the amount of traffic, many trucks and mini-busses cutting corners, spewing black exhaust fumes as they ascended and I could smell the over-worked brakes of the larger vehicles as they descended. Like all the roads in this mountainous region, I marvel at the engineering feat to build and maintain the Leh – Srinagar Highway. For many centuries, Leh was an important centre for trade, being at the crossroads of four major trade routes, one being the Indian link to the Silk Road. 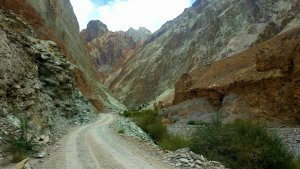 But it was not connected to the world by road until the Leh – Srinagar Highway was built in 1962. Getting to Srinagar and beyond would have been either by foot or aircraft. The road is closed during winter due to heavy snow over the high passes and Leh is again cut off (by road, though flights are possible). Kargil, (40km away) roughly half way along the route, is very close to Baltistan and the ceasefire line between India and Pakistan, and the environs around it the site of much conflict in the past. The threat of conflict is ever-present , simmering under the surface and boiling over occasionally. From Kargil we will leave the highway and follow the Suru Valley towards it’s source, then over another high pass, Pensi La and in to the Zanskar region. All going well, I should have a couple of extra days to explore the region before meeting with the GHE team of the 12th to set up two more Innovation Centres (at Skygram and Phe) and then trek out to Ralakung village, the most remote in the region, to electrify it.